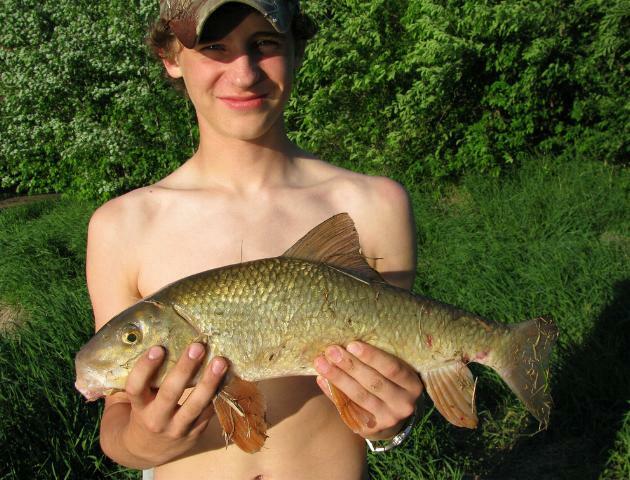 Golden Redhorse lives in calm, often silty or sandy waters in streams, small to large rivers, and lakes. Goldens have 12 or 13 rays in the dorsal fin. The golden redhorse has a gray tail and a somewhat concave dorsal fin. Color ranges from silvery to a buttery yellow-gold. The fins are invariably orange as opposed to bright red. Goldens are most often confused with the Silver Redhorse and the Black Redhorse. Silver redhorses can be differentiated by their convex, fan-shaped dorsal fin with 15 rays. Black redhorse have a more slender body and smaller scales. Golden Redhorse feed on microcrustaceans, aquatic insects, detritus, algae, and small mollusks. They spawns in the spring.